Ohhhhh man, do I ever LOVE baba ganoush – like seriously! I think I might actually like it better than hummus. Yes, I said it – baba is better than hummus. I mean, I will always love that garlicky chick pea dip but something about baba just makes my heart sing! 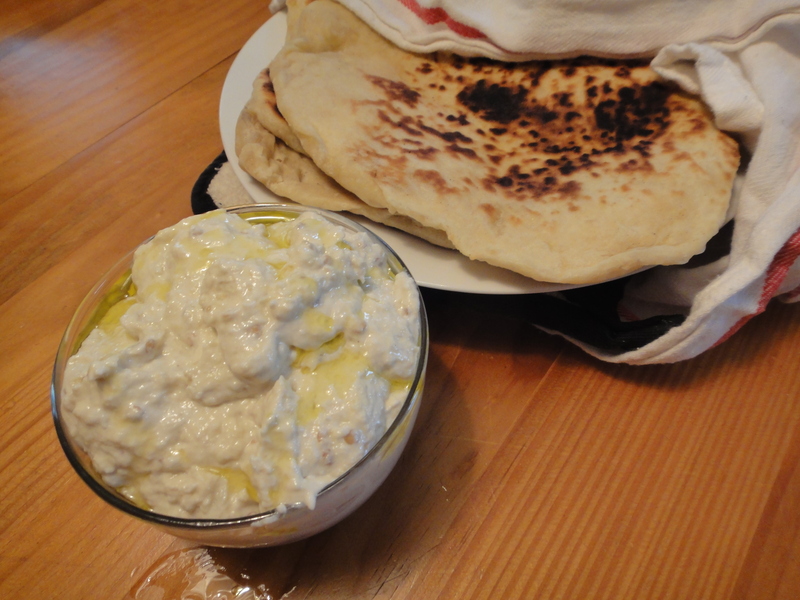 Something about the roasted eggplant flavor, creamy greek yogurt, and tahini combined with garlic and lemon juice just makes me giggle with joy – give me some solid Naan to use as transportation mechanism and I am SET! Look out summer BBQs – you’re getting a new side dish! This recipe is FAB-U-LOUS. Seriously. It tastes just like the stuff that we got at a Lebanese bakery when I was a kid – the stuff my Lebanese-craving dreams are made of. I’ve never quite found anything that compared to my childhood memory until I tried this recipe – its just about spot on! Now apparently traditional baba doesn’t have yogurt in it? I didn’t know that, but I read it in the same cookbook that I got this recipe from. Throw that thought out the window because this dip wouldn’t be quite the same without it. Take a break and try your hand at Baba Ganoush – you might not like hummus as much as you think! Prick the eggplants in a few places with a knife or fork to prevent them from exploding. Place them on a rimmed baking sheet under the broiler for 35-45 minutes or until the skins are wrinkled and the eggplant are very soft. When cool enough to handle, peel the eggplants and place them in a fine colander or strainer. Press out as much of the liquids as possible. Still in the colander, chop the flesh with a pointed knife, then mash with a fork or wooden spoon, letting the liquids escape through the holes. Add a tiny squeeze of lemon juice to keep the puree looking pale and appetizing. In a bowl, beat the tahini with the lemon juice (the tahini stiffens at first then softens), then beat in the yogurt. Add in the mashed eggplants, garlic to taste, and some salt. Beat vigorously and taste to adjust the flavoring. Serve drizzled with olive oil and sprinkled with parsley.